We’ve established a list of best practices to follow when approaching web design for accounting firms that helps separate our clients online from competitors and stereotypes. Parachute Design is a Toronto website design company and over the years we have completed our fair share of website design projects for accounting firms across Ontario and abroad. Through this experience of working with professional services firms, we’ve established a list of best practices to follow when approaching web design for accounting firms that helps separate our clients online from competitors and stereotypes. Every accounting firm has a unique personality, service offering, and budget to go along with varying degrees of comfort in web design and marketing. Our job as Toronto website designers is to guide our clients through the process, from strategy through conception and deployment, and the day-to-day management of the website. Let’s look at the best practices that our Toronto website designers follow when creating web design for accounting firms. The accounting firm website must be user-friendly and respond not only to tablets and mobile devices but various viewports on desktop and laptop computers as well. In our experience, many accounting firms have a wide range of clientele ranging from new entrepreneurs to mature business owners. Ensuring the website loads efficiently and communicates effectively in web browsers of all shapes and sizes is critical when aiming to reach such a diverse user base. For web designers, it’s fun to create a new and exciting website with all the latest and greatest technology, but web design for accounting firms is not the time and place to flex too much creative muscle. The website interface should be clean and simple in order to communicate quickly and effectively with the audience while exemplifying the trustworthy personality of the accounting firm and supporting a positive feeling of consumer confidence in the viewer. Accounting firms are often stereotyped as being straight-edged and boring, and truth is, most accounting firm website design further supports this misconception. One of the best ways to create a winning website design for an accounting firm is to make it unique and fill it with the firm’s unique personality. In combination with a clean, elegant web design, incorporating more personality into the website not only breathes life into the user experience, but also makes a lasting impression, and helps the accounting firm stand alone from competitor websites. Most accounting firm websites (and their marketing materials) are filled with the same handful of stock photographs. You know the ones with the calculator and wire-rimmed glasses sitting casually on a desk filled with charts and graphs? Ignore all of that. There are two options to consider when incorporating images into a new website design for an accounting firm. First, try to use as many original photographs as possible. This requires hiring a photographer and providing art direction to create a series of unique and consistent branded images that can be used as a foundation for the website. Second, if custom photography is not an option and stock photography must be used, focus on something other than the literal meaning of professional accounting services. A popular avenue our web designers like to take is using lifestyle imagery. This style not only works well in most cases, but helps to support the accounting firm’s personality and services in that users make a more personal connection with the accounting website and brand, and perhaps most important… they dream. After all, accounting firms are here to help us make sense of and save our money so that we can do more of what we love, right? This one can take some convincing depending on the professional services firm we are working with, however, with a little elbow grease and a case study or two, we’re often able to get the firm’s partners on board with showcasing themselves on the website. By creating accountant profile pages within the website, and clear methods of communication available to the user (whether it be email or social media), we can quickly make a stronger, more durable connection between the accounting firm and the user. People relate to other people, not calculators and spreadsheets. If we can make the firm appear friendly, professional, and approachable through great website design, the results will follow. Another surefire way to connect with your audience and provide value is to offer downloadable content that helps the potential customer. This may be tax advice, market updates, or downloadable PDFs to help clients get ready for their year-end tax review. Willingly providing this free content creates a positive feeling with the user before that first face-to-face meeting. In addition to free content, consider offering gated content such as white papers. White paper documents can be more in-depth than the free versions and entice potential customers to provide their contact information in order to download the files. With this information, you can create an email marketing campaign or simply learn more about your online user base. When we approach a new website design for an accounting firm it isn’t always about attracting new leads for the firm. In many cases, the accounting firm simply wants to use their website as a point of reference for existing clients or word of mouth referrals. In our experience, creating an SEO-friendly website design, one that will perform better in search engine results pages (SERPs), gives the accounting website a big vote of customer confidence and relevance, even if the site is simply intended to act as a reference point. Additionally, if the accounting firm website ranks well in local web searches there is a level of prestige and credibility that comes along with that ranking that speaks volumes to clients new and old. By creating a secure website design for an accounting firm our web designers are tackling several issues in one simple swoop. First and foremost, if the accounting firm and its clients are going to be transferring personal financial information via the website, the website has to be secure and well maintained. A data leak at this level could be catastrophic for the business. Many of the websites our Toronto web designers create for accountants, accounting firms, and other professional services companies feature a secure client portal that allows clients to log in and securely post financial information for their accountant to access and prepare documents on their behalf. The accountant may also securely upload documents to the website for clients to download and sign for example. Secondly, secure websites get a boost in search engine ranking. By using an SSL certificate to secure the website you’re telling search engines that the website is safe and secure, which can help your accounting firm website leapfrog the competition online. By following these accounting firm website design best practices, our Toronto web design team have been able to help numerous accounting firms and professional services companies from across Canada accomplish their online objectives. 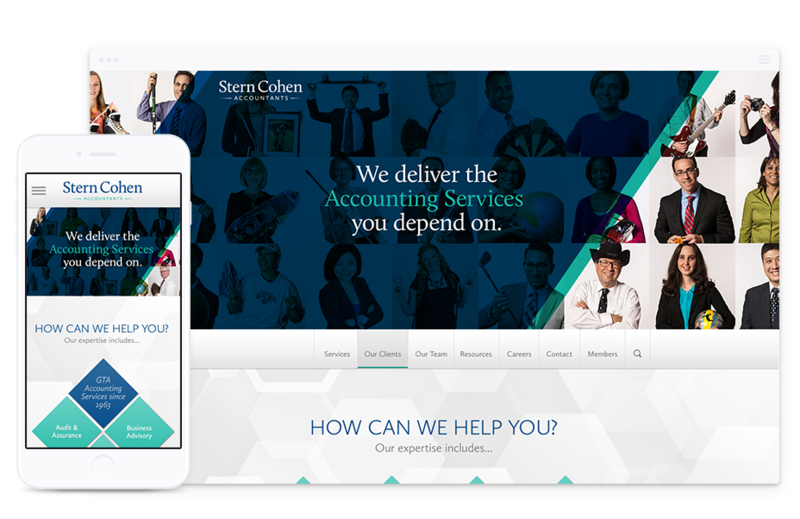 Most recently, our logo design and web design for Stern Cohen won awards for best corporate rebrand and best website design in their industry. To learn more about Parachute Design and our approach to web design for accounting firms, or to have us prepare a proposal for your professional services business, please complete our online quote request form. You can also reach our Toronto web design team by calling 416-901-8633 or through our contact us page. Need an Accounting Firm Website Design Quote?